To respect the character of the surrounding early 20th century residential buildings, RRA clad the kindergarten with wood in the vertical grain direction to blend the structure into the landscape, but also gave the timber volume a distinctive and contemporary shape. One end of the building lifts up and off the ground into a cantilever that shelters the main entrance below. A series of square windows punctuate the exterior at different heights. In contrast to its mostly monochromatic facade, the interior is filled with art, colorful staircases, and whimsical shapes. The building offers two units for children aged 1 to 3 years old and two units for children 3 to 6 years old. All units share a common area with kitchen located at the heart of the building. 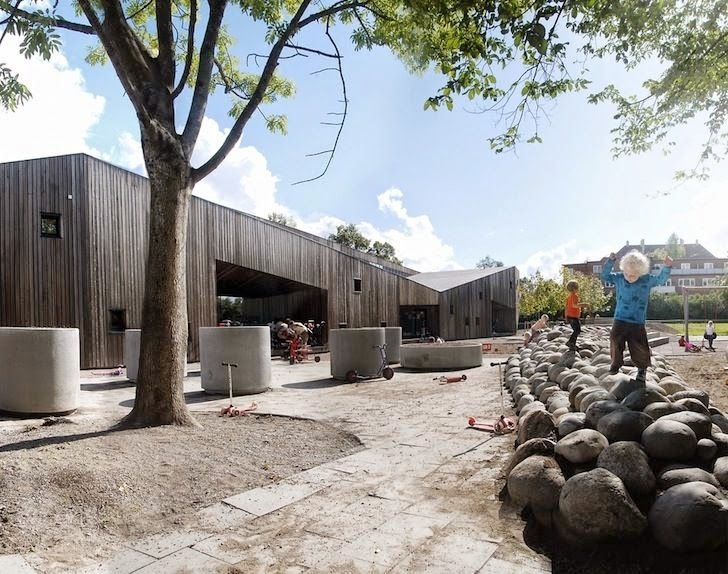 The kindergarten is also attached to an enclosed outdoor play area.